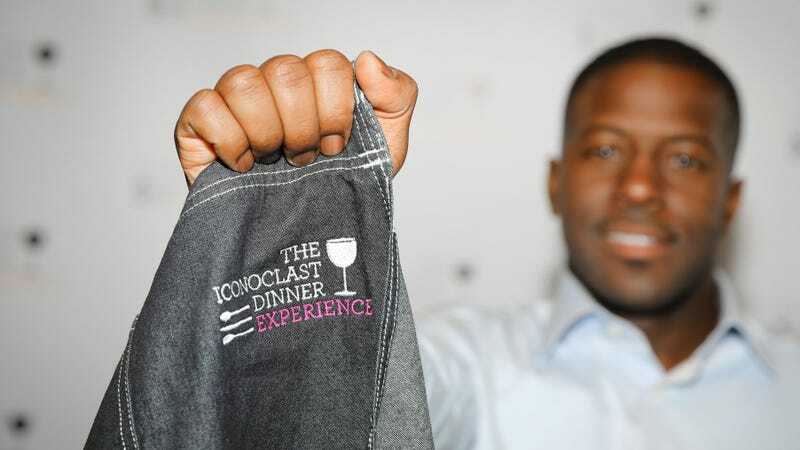 Two-time 2018 James Beard Award-winning chef Eduoardo Jordan proudly displays his Iconoclast Dinner Experience apron. Guests of the Iconoclast Dinner Experience who assemble at the James Beard House in New York City on Saturday are in for an incomparable experience. It’s the experience that culinary enthusiast and founder Lezli Levene Harvell envisioned when considering what—and who—was missing from the ultraexclusive foodie gatherings that she frequented. Not surprisingly, Levene Harvell also noticed that the color at any given culinary event was primarily on her plate. Rarely were there other guests who looked like her, let alone chefs of color creating the meals being enjoyed. Determined—even as an outsider—to inspire a cultural shift in culinary culture, she imagined a series of events that would introduce foodies of color to chefs who reflected their experiences, as well as introduce chefs of color to audiences that would have an innate appreciation for what they were offering, and give them opportunities that might not otherwise arise. That mission became the core of the Iconoclast Dinner Experience, and it has reaped tremendous rewards. Chefs Kwame Onwuachi and Eduardo Jordan share a laugh during the IDE All-Star Culinary Bash on May 5, 2018, at Soho House Chicago in Chicago. “Celebrating culture through the lens of food” is one of Levene Harvell’s passions, and it’s evident in her choice of chefs, who hail from all over the country (and, occasionally, outside it) and cite influences from all over the world. Chopped: Grill Masters champion and StarChefs Rising Star 2017. Johnson also attended Le Cordon Bleu in Pasadena, Calif., although his education in French cooking originated with his Southern grandmother. It is likely this blend of earth-loving cultures that has fostered his respect for raw ingredients, allowing them “to speak for themselves without too much manipulation,” as noted on the Iconoclast site. The honour of being invited to cook at James Beard—and in particular, for an event which showcases chefs and culinary arts among people of colour—is a huge deal. And the fact that its proceeds benefit Spelman College students from Jamaica and sub-Saharan African countries is phenomenal. Being virtually the only chef in the U.K. putting food from the African continent front and centre of the British food scene over the last ten years, I have made a career and a personal mission of creating a debate around the reasons why our food and chefs have taken so long to gain prominence on the high street, in the media and other means of culinary representation. So, of course, the fact that this event even exists is a stunning leap forward in an industry that is still dominated by a white middle class stronghold, and it’s something I would love to see developed in Europe and the U.K. also ... a magical celebration of the true diversity in food and the melanin-rich faces creating it. Adjonyoh is a self-taught chef who honed her craft hosting supper clubs in her home, eventually launching residencies at restaurants across London and Berlin. In 2014 she launched a contemporary West African restaurant, Zoe’s Ghana Kitchen, in the London neighborhood of Brixton, which recently moved to a larger location in East London. I have maintained a mission to bring African cuisine to the masses, always adopting my menu to fit the occasion and people it serves. ... I am constantly striving to break down negative stereotypes of food from the African continent whilst celebrating the rich diversity of its food and culture ... I have been foretelling the African food revolution since 2010 and I’m glad to say it’s finally arrived. When the delicious worlds of Johnson, Adjonyoh and the others participating in the 2018 Iconoclast Dinner Experience collide on Saturday, the results will be an undeniable explosion of flavor for the diners in attendance. But the rewards will be just as sweet for the chefs, who will showcase their best at an event equally curated for them. Iconoclast creator Lezli Levene Harvell greets guests at the IDE All-Star Bash at Soho House Chicago on May 5, 2018, in Chicago. It’s not too late to celebrate with the Iconoclast Dinner Experience on Saturday. Tickets for New York City’s June 9 afternoon event, Taste of the Iconoclast Dinner, are $150, and tickets to that evening’s seven-course Iconoclast Dinner are available for $1,000. Editor’s note: A previous version of this article misidentified chef Joseph Johnson as chef Joseph “JJ” Johnson, culinary chair of the Iconoclast Dinner Experience. The article has been updated to reflect this.